BEIJING (Sputnik) - French President Emmanuel Macron intends to present Chinese President Xi Jinping with a horse as a state gift during his first visit to China as France's President, Chinese Foreign Ministry spokesman Lu Kang said Monday. Macron is paying an official visit to China at the invitation of Xi, which will last until January 10. It is Macron's first visit to China since May 2017, when he became France's president. 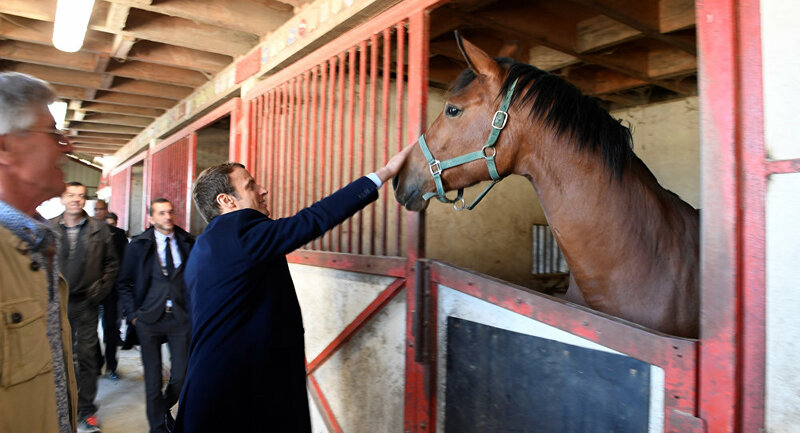 "That's right, French President Emmanuel Macron is going to give Chinese President Xi Jinping a horse as a state gift. We express our gratitude to the French for this friendly gesture," Lu said at a briefing. READ MORE: What's on the Agenda of French President Macron's First State Visit to China? According to the Elysee Palace, the official residence of the French president, during the visit of the Chinese president in 2014, he was escorted to the Elysee Palace by 104 riders of the Republican Guard and was "fascinated" by their outstanding skills. A retired horse named Vesuve de Brekka is an 8-year-old brown bay gelding who joined the Republican Guard in 2012. According to reports, the animal has already been transferred to China to undergo quarantine. Macron will also give Xi Jinping the horse's harness and a a saber with the following inscription: "M. Emmanuel Macron — Président de la République Française — Pékin — Janvier 2018" ("Mr. Emmanuel Macron — President of the French Republic — Beijing — January 2018 "). The tradition of giving animals as a present is quite popular in the international arena. For example, China is known for its so-called "Panda diplomacy." Beijing has been using pandas as diplomatic gifts for many centuries. However, Chinese officials are only lending their pandas to the zoos all over the world in order to protect the species. In 2012 Beijing lent a couple of pandas, Huan Huan and Yuan Meng, to France. In December 2017 France's First Lady Brigitte Macron assisted in the naming ceremony of a tiny panda, born from one of those on loan at a French zoo. What's on the Agenda of French President Macron's First State Visit to China?